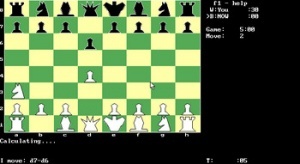 a chess program by Mark Lefler, competing at one World Computer Chess Championship, the WCCC 1999 in Paderborn, and two World Microcomputer Chess Championships, the WMCCC 1991 and WMCCC 1993. Now further played the ACM 1990, ACM 1993 and ACM 1994, all three editions of Don Beal's Uniform-Platform Computer Chess Championship, the IPCCC 1994 and five Aegon Tournaments. Now tied with first place among all chess programs at the Aegon 1996 Tournament, receiving 4.5 out of 6 points. This tied the program with other world class programs such as Fritz, and it beat Grandmaster Larry Christiansen  . Now was written in Pascal, running on PCs with MS-DOS operating system. In 2007, Mark started a rewrite using C  .
Written by Mark Lefler, who has spent two full-time years developing his program, and competed in last year's ACM tournament. The evaluation is mostly piece values, with positional scores sometimes worth up to two Panws. Search techniques used include iterative deepening, with check extensions, no singular extensions, and hung-piece extensions at depth zero. This proginated as a shareware program by Mark Lefler, possibly going to be re-released with the latest version. The program scored equally with GNU in the "uniform platform" tournament last year. NOW has specialized knowledge about some Pawn and Bishop endgames. Its search mechanism includes extensions for certain tactical threats, and is selective in its last 3 plies. General alpha beta searcher, with lots of knowledge. Has done well against humans, as evidenced by the Aegon matches. ↑ Zillions of Games - Who Are We? ↑ Don Beal (1993). Report on the QMW 1993 Uniform-Platform Computer-Chess Championship. ICCA Journal, Vol. 16, No. 3, pp. 166-171. This page was last edited on 14 January 2019, at 22:03.